You have written some piece of software which facilitates a routine operation in many businesses or organisations. You use this licence agreement to sell your software to each customer for his use. If you wish to sell or licence your entire rights for someone else to sell on, please select a different template from the list linked below. You may be a consultant or expert and the software facilitates performance of tasks in the area of your expertise. Alternatively, you may be an IT professional who has written this software specifically to sell Worldwide. To make the agreement easy to follow, we have assumed you are an HR expert and have written software to facilitate HR management. In truth, the range of possible applications is without limit. It is assumed that the software could be used in any industry. You have a menu of possible restrictions and conditions you place on your licence. You choose the exact deal you want in this agreement. You are always in control. You can choose the period the deal is to run, what systems your “widget” can be used in, what countries or territory, and many more options. Each of these is the subject of a separate sub paragraph, for easy edit by you. You can choose “in” or “out” or edit. This licence agreement provides for different payment arrangements too. Use fee per user, initial cash payment for a fixed term, then an annual fee for renewal licence. It provides options for telephone support, periodic upgrades, bug fixing, email 24 hr response weekdays, consultation at an hourly rate and training. This agreement provides the complete legal framework for what may appear to be a complicated deal. 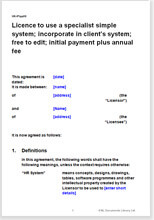 The Net Lawman modular structure in plain English takes you smoothly through the detail of a document of over 4,800 words. Over 2,700 words of helpful drafting notes.